Choosing a winner to your giveaways shouldn’t be a chore. Rafflecopter gives you the tools to make it really easy, and we want to show you how! The post below describes the most efficient way possible to moderate entrants and choosing winners to your giveaways. When your giveaway ends, go to the ‘moderate/pick a winner‘ page. Click ‘add a winner’ to *drumroll! * choose your first winner. Take the winner’s name, email, and IP address, and open up “The Grid” by clicking on ‘show list’. Verify that the chosen winner completed the mandatory entry option(s) as well as the entry option they were chosen for correctly by searching for their name, email, and IP address. If the winner(s) chosen can be verified that they entered correctly, great! If the entry is determined invalid, delete their name from the ‘add a winner’ list and pick a new winner. 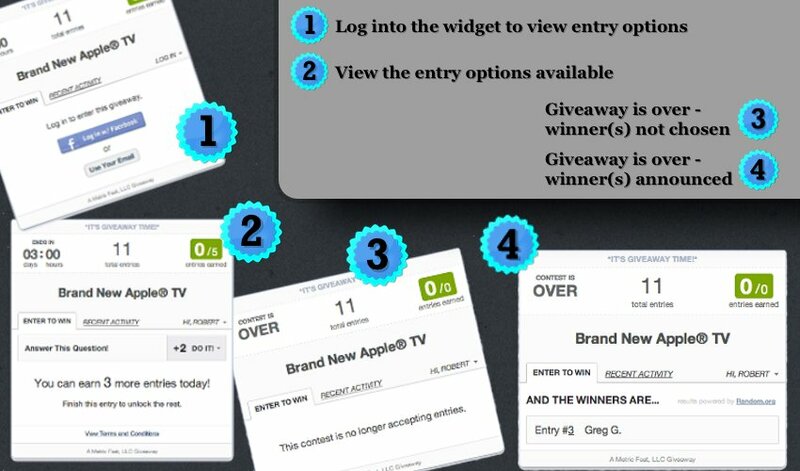 When you’re done choosing your winner(s), click the ‘announce button to display the winner’s name(s) on the widget. After your giveaway starts and you’ve received a handful of entries, check to see your giveaway’s directions are being followed by your entrants. If they aren’t, take action. See if there’s something you can do to make your directions more clear. We’ve written a blog post that touches on several tips to make your giveaways the best they can be. With Rafflecopter, you have the ability to customize and create your own entry options. To save you time for when the giveaway is over, it’s recommend that you create your entry options so that your entries can be easily verified. If you’re new to Rafflecopter, we have several posts that might help you inform your fans how Rafflecopter works. Here’s a post that includes a video on how to enter Rafflecopter giveaways. Thanks for the blog post! Just wondering: when you select and announce a winner, will they be sent an email notification? Hey Heather – nope! It’s up to you to notify the winner :) We do provide their email address though! How would this work if the giveaway is solely based in Facebook? In this case the email address wouldn’t necessarily be available, correct? Am I correct in assuming I would have to notify the winner via their Facebook page/Tag them in a post, etc? So, if I’m running my contest just in Facebook, what would be the best way to notify the winner(s)? So then does that mean that the email address tied to the each entrant’s Facebook account will be listed in the “Show list” section? Awesome possum! Thanks for your quick help! This helped me a lot. Thank you!! except when you follow the directions and it doesn’t show you the winner…. I have two prizes in one contest- grand prize and 2nd place. I clicked “add a winner” and it randomly chose a name (which I intended for the 2nd place), now if I click to add another for the 1st place/grand prize, do I need to list on my site which person won which prize? or is there a place to label each one on the Rafflecopter? (1st prize, 2nd, etc.) thanks! I would love to see the option of banning cheaters. Rafflecopter really looks promising! I’m going to try it out in my giveaway and see how it goes. Can I give away like X number of Prizes to X number of winners or is it a one prize, on winner situation? I’d also like to know how many winners you can have on a Rafflecopter giveaway? We have 12 prizes and would like to have 12 winners, do we need a separate rafflecopter for each prize or can we create one giant raffle copter and choose winners corresponding to their winning number? Is there a limit on the number of winners? Yes – you can select as many winners as you’d like by clicking the ‘add a winner’ 12 times if you’d like. You’re more than welcome to create 12 individual widgets or just one – completely up to you! It all makes sense but step 2 is where I get stuck. I hit pick a winner but I don’t see the step 2 info anywhere! hey Scarlet – sorry about that! can you try signing out of your account, clearing your browser cache, and signing back in and see if that helps? I am wanting to know if I can choose a winner based off a the area they live? I’m having a few photographers giveaway mini sessions. Each photographer located in a different state. Any ideas? Thanks for such a great resource. I am getting a contest ready and want to know if I will be able to choose 1 winner a day for several days before the giveaway ends. With the grand prize winner being the day it ends. Hey Peggy! You might be able to run the promotion with one entry form and choose winners on a daily basis on that form. We’ve had quite a few folks do that and have it work out well. The only downside to that is in order to announce the winner inside the widget, the giveaway must be completed and no longer running. So if you were to use one form, you’d still be able to choose winners, but you’d have to announce them outside of the widget until the promotion is over. That way, when the giveaway is over, you have a collection of all the entries and will be able to choose the final grand prize winner if you liked. Let me know if that makes sense! Thank you. That sounds great. Can we choose a winner manually ? I mean not a random but a winner which we want ? If you dont use the moderate form will it still pick a winner for you or is it just for the moderate format? There is NO ‘moderate/pick a winner’ page in my account and the contest has ended. How do i pick a winner? Thanks for the easy instructions. I am about to have a giveaway and am glad to get all the information up front before I start. Just curious: Is it possible to manually enter entrants? For example, if I have a live event and people sign up for the contest on paper, can I then add them to the Rafflecopter giveaway before picking a winner or do I have to have them enter themselves on the widget? I just have one question. When using rafflecopter is it possible to choose who you want to win instead of it being a random thing? Blog owners are able to “moderate” a winner of there choice by deleting those they don’t want to win. It is unfair, but I’m positive at least one blog I quit going to does it. They had repeated winners of ALL of their big prizes. Statistically it would have been impossible. How about logging IP’s to stop all the scammers with multiple accounts entering! Honestly, it makes me feel sick looking at all these “fans” that have nothing on their profiles but competition entries. HI, I’d like to know if it’s possible for the host to pick out a winner on their own accord rather than randomly. Let me explain this further with a real example. First, blogger No. 1 says she’s not taking part of a certain ticket giveaway at another blog because a dear friend has already given her one. A week later, blogger No. 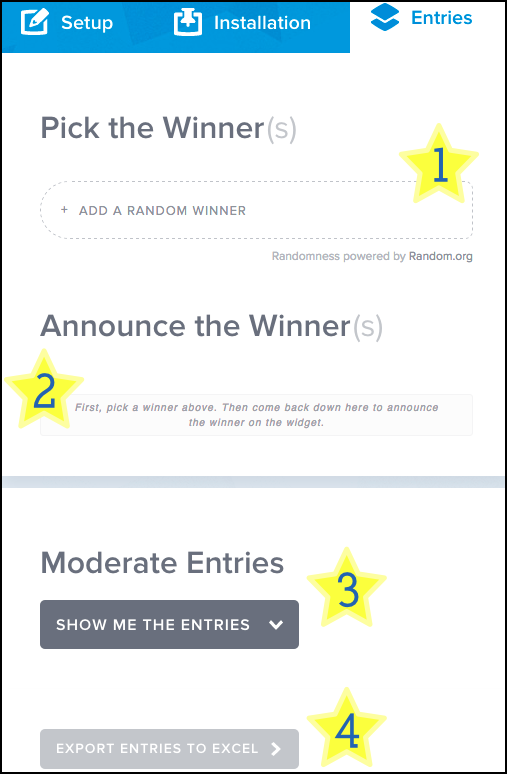 2 hosts the same ticket giveaway (via Rafflecopter) and guess what, Blogger No.1 is the first winner! Naturally enough, everyone asks Blogger No.1 if she is giving away this ticket as she had previously announced she had a ticket already and you know what? She says THAT is the ticket her friend gave her!!! So my question is how could Blogger No.2 “dodge” the application to make her friend (Blogger No.1) appear as the first winner. I’ve seen the Rafflecopter results with my own eyes and I just couldn’t believe it nor do I think this gives a Rafflecopter a good reliable image if hosts can manipulate results and favour their friends rather than picking random winners. Needless to say, everyone is entitled to do as they please what their giveaway prizes, what bothers me is the fact that Blogger No. 2 made this look as if it was sheer luck and her friend had just got lucky. I’d really appreciate any feedback on this. Totally inaccurate when I clicked on my moderate button. Almost screwed me. There are a few things I don’t know how I can possibly verify: whether they’ve liked the relevant Facebook page (Facebook doesn’t show you all the people who like your page), whether they’re following your blog on GFC/Bloglovin (neither of them show you all your followers in an easy to see way). I know it isn’t directly Rafflecopter but how are you supposed to know whether they’ve actually completed the entries properly? Hi, is it possible to pick a winner in the middle of the Rafflecopter? I wish to do a 15 days long rafflecopter, and want to announce one winner after 7 days and another at the end of the rafflecopter, after 15 days. I cannot get my winners what am I doing wrong? Hey @annie315:disqus – Can you email us at support @ rafflecopter.com and we’d be happy to help you figure out this issue! Hey @annie315:disqus – Can you shoot our support team an email at support (at) rafflecopter.com If you can do that we’d be more than happy to look into this issue! I have tried using the moderate button it wants me to upgrade and says no winners will soon be flooding in..
I’ve picked a winner using Rafflecopter, and it indicates she liked my page on Facebook, but how can I easily verify this on a page with over 1000 likes? Any help would be appreciated. Thank you! I’m hosting a multi vendor giveaway and was wondering if I add all prizes and have people like the pages of only the prizes they would want to win, how do I go about choosing one winner per item? Is there an option to choose one winner for each entry method? Creative discussion – For what it’s worth , if your company is wanting a MA Raffle And/Or Bazaar Tax Return , my friend filled a sample form here https://goo.gl/W6YNzp.